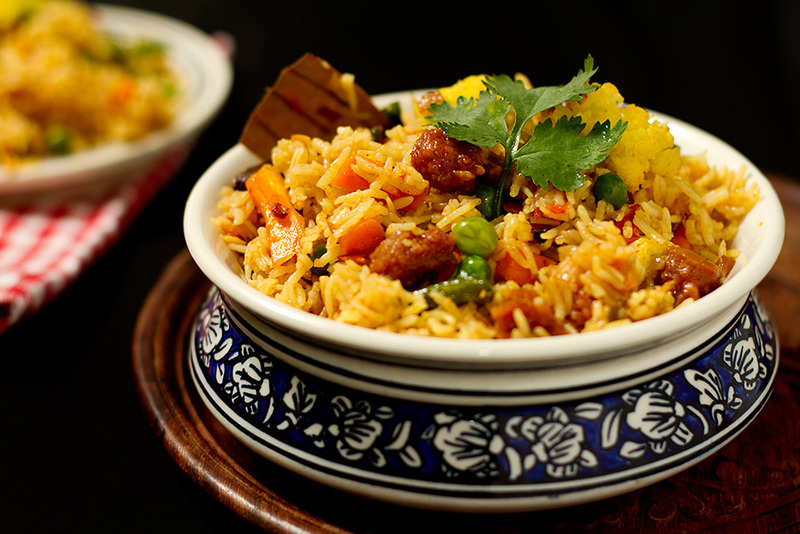 When you are out of ideas for a quick meal, this recipe will come to your rescue The vegetable pulao is a flavourful medley of assorted vegetables, aromatic herbs, mild spices and rice cooked together. Legend has it that some nawabs of Awadh preferred the dry fruits laden version of pulao with melt in mouth mutton pieces to Biryani simply because the layers of flavors that this dish has. This is a vegetarian version of the Nawabi pulao that I often make when I want to cook something exotic. The English term pilaf is borrowed directly from the Turkish pilav, which in turn comes from Persian polow, Hindi pulāo, from Sanskrit pulāka (meaning “a ball of rice”), which in turn, is probably of Dravidian origin. The English spelling is influenced by the Modern Greek pilafi, which comes from the Turkish pilav. Pilaf was known to have been served to Alexander the Great at a royal banquet following his capture of the Sogdian capital of Marakanda (modern Samarkand). It is believed that soldiers from Alexander’s army brought the preparation of pilaf back to Macedonia, after which it spread throughout Ancient Greece. The ancient Indian text Mahabharata mentions rice and meat cooked together, and the word “pulao” or “pallao” is used to refer to the dish in ancient Sanskrit and Kannada works, such as Yagnavalkya Smriti. It is believed that the proper preparation of pilaf was first documented by a tenth-century Persian scholar named Abu Ali Ibn Sina (Avicenna), who in his books on medical sciences dedicated a whole section to preparing various meals, including several types of pilaf. In doing so, he described advantages and disadvantages of every item used for preparing the dish. Accordingly, Uzbeks and Tajiks consider Ibn Sina to be the “father” of modern pilaf. Heat oil in a pan and fry half the onion and half of ginger till onions become red. Add to it cauliflower, carrots, french beans, peas, a pinch of turmeric and salt. Stir fry for about 5 minutes, remove and keep aside. In a pressure pan heat ghee add bay leaf, cumin seeds, cloves, peppercorns, black cardamom, cardamom and cashews. Fry till cashews become slightly pink then add raisins. Tip in the remaining onions, ginger, green chilies and garlic and fry till the raw smell goes away. Tip in the nuggets / moon badi and fry for 2-3 minutes. Add turmeric, red Chile powder and coriander powder and stir for a few seconds. Add the washed rice and stir. Sprinkle salt, add water (about 4 cups) and close the lid of the pressure pan. Cook till the rice is done. This takes about 1 whistle and 5 minutes on medium heat. Switch off the stove and allow the pressure to drop. After the pressure drops, open the pressure pan, stir in the half cooked vegetables, and shut the lid back for 10 minutes. This will make sure that the vegetables are cooked completely and yet have a bit of crunch. Serve garnished with fresh coriander.